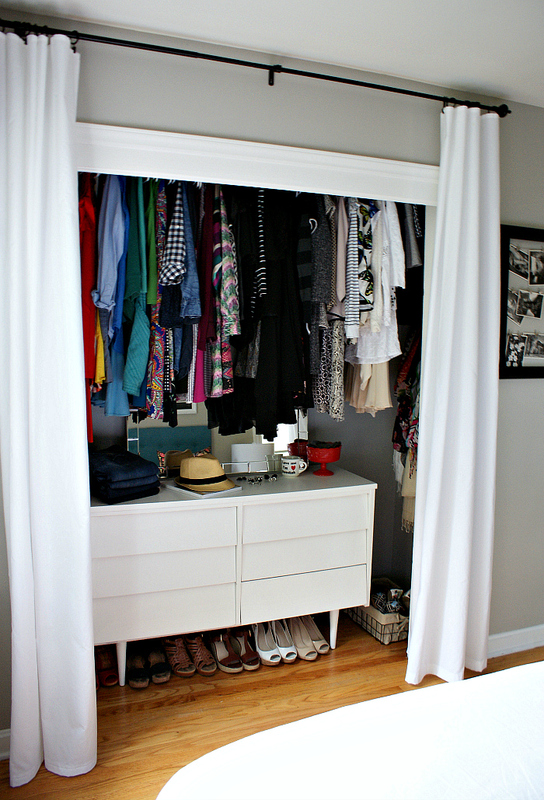 My closet was driving me bonkers. Putting away laundry usually went like this: Fold everything neatly, avoid putting it away, give in a day or two later, roll eyes, mutter, curse, cram laundry into closet, repeat once a week. 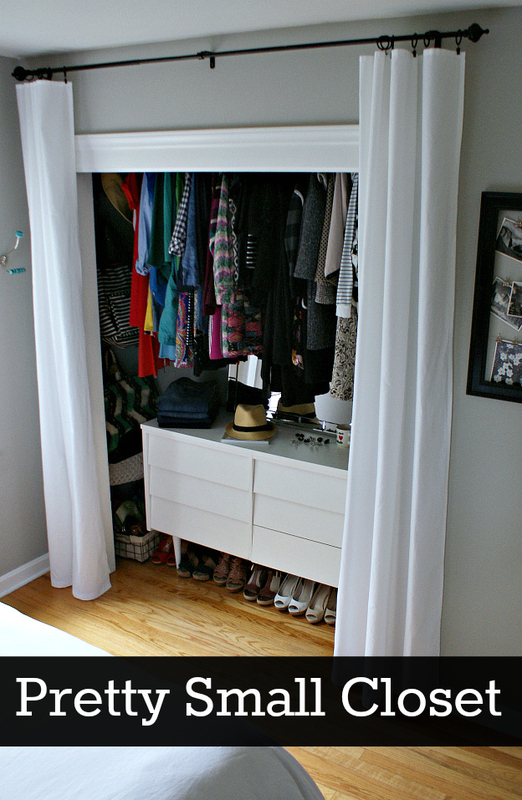 Space wasn't really the problem; I'm not a super fashiony person, so I can deal with a small closet.The main frustrations were a pair of sliding doors (which fell off their track at least once a month, sometimes onto my toes!) and the lack of usable storage. The closet had a rod and narrow shelf right at eye level, so I couldn't effectively store anything above or below. We are still chipping away at our basement overhaul, so I wanted to come up with a way to spruce up the closet without roping Jesse into a big distracting project. I also wanted to spend little or no money, which I did by re-purposing a few things we already owned. First, I took the doors off the tracks and stashed them in the basement. I figure if we ever sell the house, the new owners might want to put the doors back on. Then I cleared everything out, setting aside a basket of clothing and shoes for the Goodwill. We moved the closet rod and shelf up high, and mudded over the old mounting spots. This took maybe ten bucks worth of materials and about an hour for Jesse to do, he works fast! I painted the closet gray to match the rest of the bedroom, then added my grandmother's mid-century dresser (here's how we used it a few years ago). 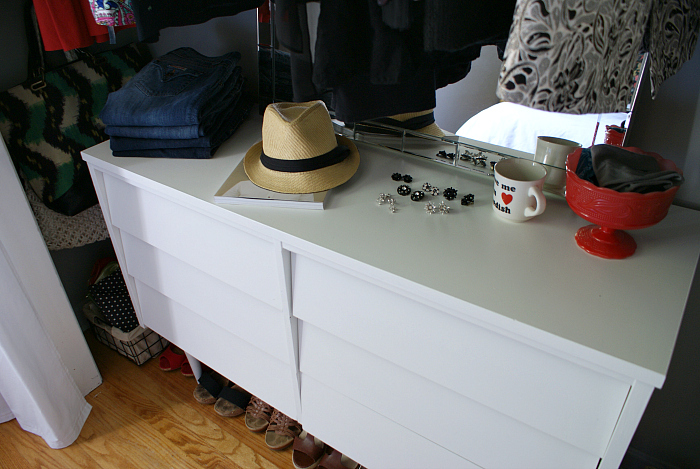 The dresser adds quite a bit of storage plus counter space for baubles and accessories. The fresh white paint looks great with the style of dresser and brightens up the space. I set a previously owned mirror (West Elm) on top of the dresser to reflect light and give it a boutique-y feel. For handbag storage, we added two big hooks to the left inside wall (again, previously owned). 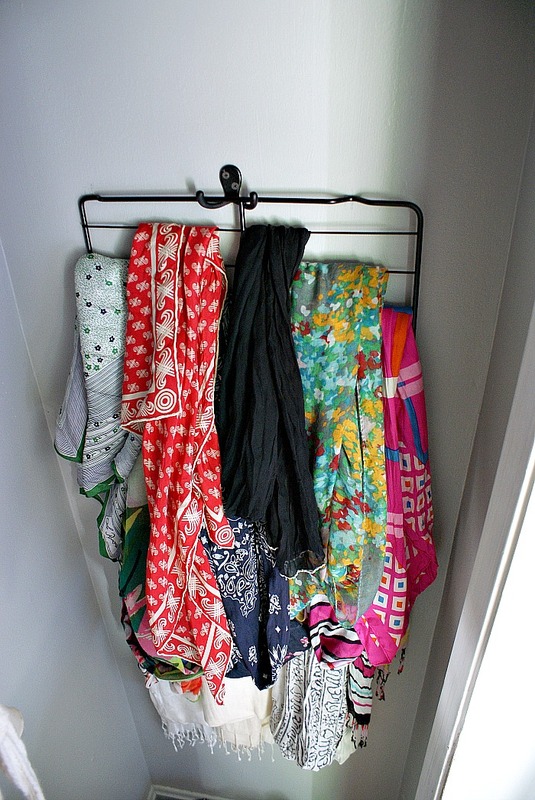 On the right, my scarves are all layered up on an old oven rack ($1 at ReStore) that I spray painted black and hung from a double hook. 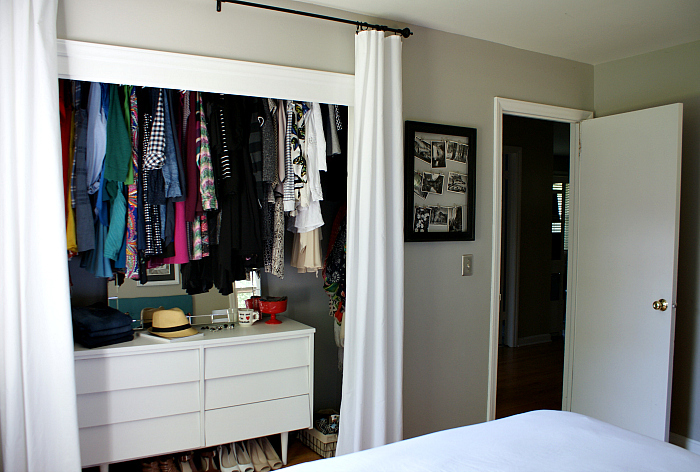 For the closet curtains, I spray painted a rod and rings black and hung them as high as possible above the closet opening. Then, similar to the entry way closet, I turned a queen sized sheet into custom curtain panels. When I put everything back into the closet, I put several more items into the Goodwill basket and arranged everything by color. I've never tried arranging by color and at first I thought it was silly, but I've been maintaining it for a few weeks now and I love it! I'm loving my pretty small closet! Taking the doors off made our little bedroom feel more open and makes it so much easier to find stuff. 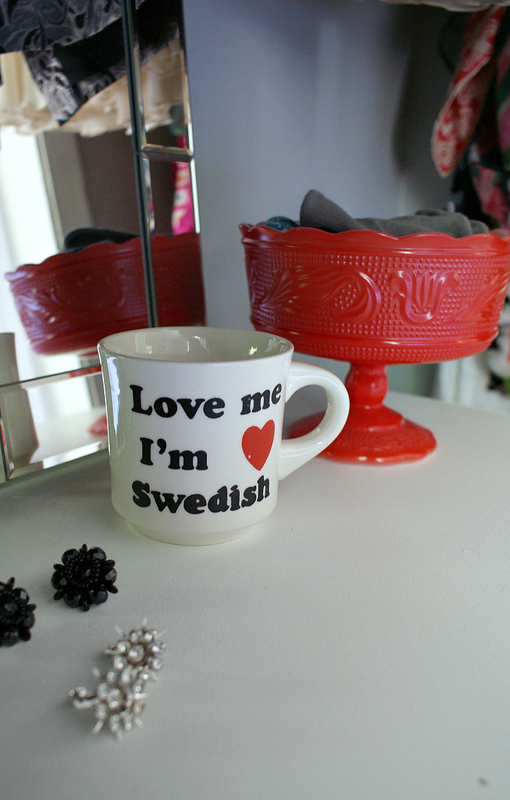 I also love the boutique-y feel that the dresser and accessories give it. The space is way more functional now and holds almost everything; I have a bin of bulky sweaters and a bin of winter boots stashed in the basement. And the best part is that now I'm not constantly cursing like a weirdo while putting away laundry! Luv this idea, I am doing this today😊.